Split and Zadar are far away one of each other 157 kilometers. Duration of that trip is about 2 hours and 45 minutes. However, if the traffic is dense your trip will be longer. Prices of a one-way ticket for bus starts from 70 HRK, but if you buy round-trip ticket is usually calculated an additional discount. The best offer of the bus ticket offers of Croatia Bus for departure in 10:15 from Zadar. The most expensive bus ticket is 101 HRK for the bus that departs at 22:30, and whose arrival at the destination is provided in 01:00. In case that duration of your trip is important you can choose the fastest bus of Autotrans carriers that will arrive for 2 hours and 5 minutes to your destination. Buses on the line Zadar - Split depart throughout the day, and are divided in a dozen departures. The largest space between two departures is between 22:45 to 02:30. Besides that, the longest period when buses do not depart from Zadar to Split is 2 hours and 15 minutes and concerns the period between12:45 to 15:00. All news and events, as well as accurate information regarding discounts, offers, and announcements, ask at the information desk. There you can be informed about the discounts that are approved for each category. For example, discounts for children, students, and senior citizens. Additionally, if necessary, ask for a detailed timetable and additional services. Bus Station Zadar is located in the street of Ante Starcevic 1, or nearby the coast. In its surroundings you will find a whole range of different content. Besides to the classic one such as banks, exchange offices, shops, kiosks, bars and restaurants, you'll find the station atypical facilities such as furniture shop and sports betting. The route Zadar - Split is 157 km long if you go by highway, and 170 km if you go by the old Adriatic road. It is on you to choose options for your trip. Traveling by the old Adriatic road is usually longer. Consequently, if you go by highway you'll be in a bus around 2 hours and 45 minutes if you select the bus that drives by an old Adriatic road you could be in the bus an additional hour. Nevertheless, the old road is not a necessarily bad option. The common perception is that traveling by this road is more interesting because of passing through various towns and cities that are situated close to the sea. Hence her unofficial title - Adriatic tourist road. The bus station in Split is located at street Obala Kneza Domagoja No. 12. This means that it is located near the main train station and the ferry port. The station is equipped with sales counters, a wardrobe and waiting room. The capacity of the waiting room is not at a high level due to the fact that this is the biggest bus station in Dalmatia and that every year through it goes thousands of passengers. If you stay out of the sitting place, time of departure to your destination shorten with coffee in one of the nearby cafes. Before that, we suggest you leave your luggage in the wardrobe that works from 6 a.m. to 10 p.m. In case that is full, it is good to know that you can use wardrobe at railway station whose working hours are the same, and the price of keeping luggage is 15 HRK for 24 hours. Also, around the bus station, you can find various facilities, such as shops, kiosks, bakeries, coffee bars, banks, and ATMs. Croatian carriers hold international standards when equipping their buses. This is the fundamental reason why the buses on the route Zadar - Split are modernly equipped. All of them are, almost without exception, equipped with air conditioning and TV receivers that allow passengers comfortable time of traveling. It's not uncommon that bus has a toilet and Wi-Fi signal. You should not rely on the Wi-Fi in the bus. So if you are a serious lover of surfing be sure to have your own web access. The line Zadar - Split is covered by various forms of transportation. The most common among them are vehicle, bus, train, and plane. In the following, we'll do a comparison of the bus with other means of transport. The car might seem like an ideal solution for transport on this route. However, the profitability of the car decreases if you count the cost of fuel and toll for a highway. If you choose the old road to avoid additional costs you’ll travel the same duration like you are travel with the bus. If you travel by train you'll have only three available lines per day. The first departure is scheduled for 7:35, and duration of travel with that train is about 6 hours. Another train from Zadar via Split is at 14:40, and trip with that train is longer than 6 hours. Just when you thought that it was too much time for approximately 160 km, the third departure at 20:29 will be in Split for about 13 hours and 30 minutes. Indeed, bus offers reasonable prices one-way and two-way ticket, bus also offers a numerous choice between a daily departures and driving comfort and safety. Conditions of traveling correspond to the price of travel and we'll compare bus with travel by air on this route, also. Distance from these two cities is 118 km. When you arrive at the Split airport, you'll have to organize transport to 25 km distant from airport and city of Split. It seems it is much more costs for only 118 km if you travel by plane than to travel by bus. Finally, select in its sole discretion what seems like the best option. 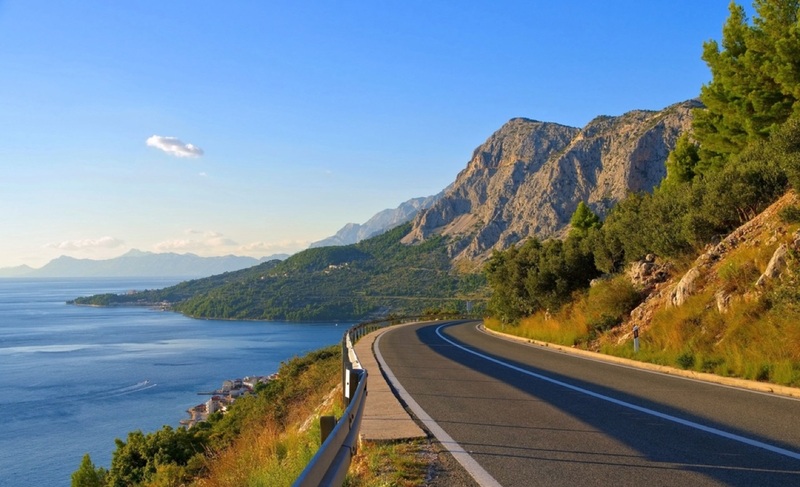 If you choose to buy a bus ticket for the bus that runs by the Adriatic road be prepared on beautiful landscapes. Regardless, except Split, you will pass the following cities: Biograd, Vodice, Trogir, and Primosten. When we talk about Biograd we talking about Croatian royal town which was first time mentioned in the tenth century, and today is a popular tourist destination. Next is Vodice which is in recent years a hit destination for the younger generation because it's rich in bars and clubs. There, at least during the season, in the true sense of the word is never boring. Furthermore, Primosten preserved the atmosphere and all the architectural features of a medieval Mediterranean fishing village. The greatest attention in Primosten attracts the Curch of St. George placed on the highest point. Trogir is a historic town and port located in the Split-Dalmatia County. It abounds with the old stories and legends. Zadar is located in the Zadar County and is its cultural, tourist and economic center. Enriched with various sights and many of them are from more recent time. 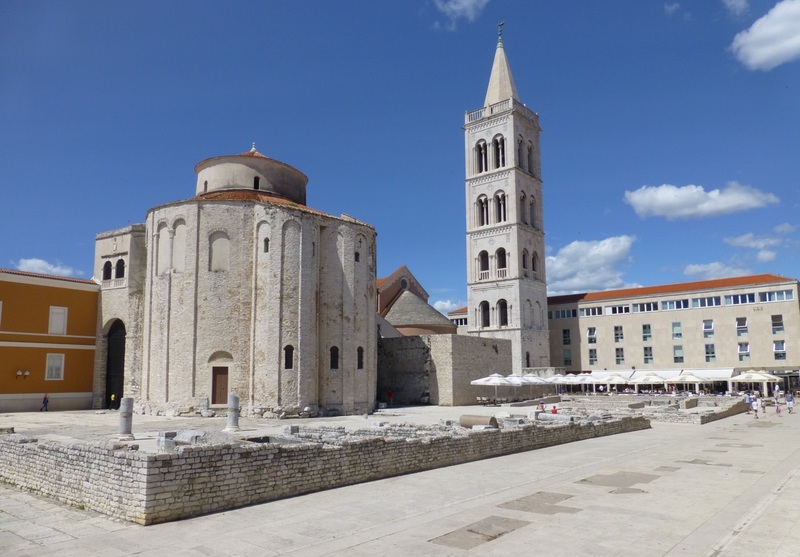 Zadar is the ideal combination of historical and modern. The sights that belong to the past are the Church of St. Donat, Forum, and Five Wells Square. On the other hand, the modern monuments belong unavoidable Sea Organ and Greeting to the Sun in which all visitors enjoy. Besides is a new hit sight, the Sea Organ is a modern icon of the city, which creates an amazing sound, the so-called. "Sea music" that are extending through promenade by the sea. With them on the west side lies Greeting to the Sun, which absorbs sunlight during the day and by the night produce game of lights. Guides are not necessary. Just follow the rhythm of the city and flow of people through its streets. Kind of a symbol of Zadar is a popular street Kalelarga, whose official name is Siroka ulica (Broad Street). In it are placed: bars, restaurants, and shops. Prepare yourself to be in the crowd during the evening especially in summer months. Finally, did you know that the worldwide popular maraschino liqueur is originally from Zadar? It is a drink recognizable by the distinctive sweet flavor and aromatic scent of cherries. Once when you are in Zadar we hope that you are planning to visit the Pag Island and meet popular spots such as Novalja and well-known beach Zrce. 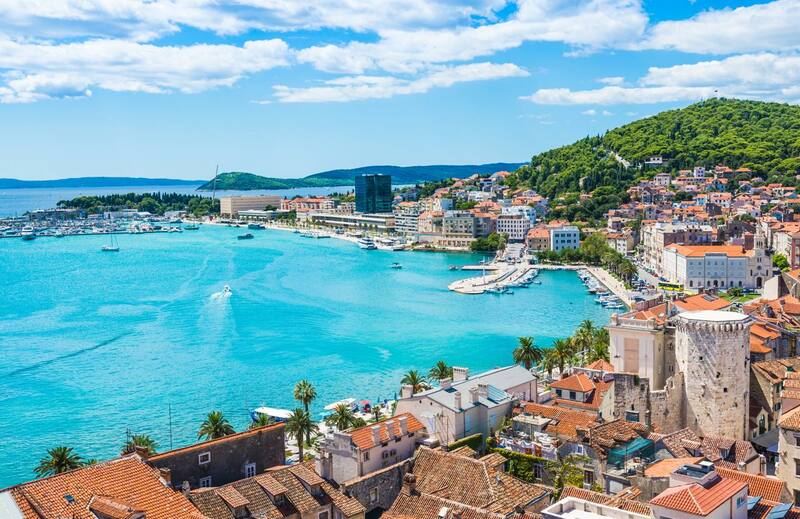 The city of Split is one of the oldest Croatian coastal cities. 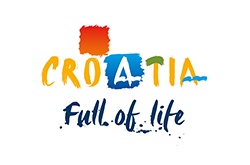 Besides being touristic, it is also a cultural and economic center of the Split-Dalmatian County. Among the various sights, the most attention attracts Diocletian's Palace. It is an ancient palace that was built by the Roman emperor Diocletian in the 1st century and Diocletian had stayed there after the withdrawal from the throne. Apart from it, we suggest you take a walk by the Narodni trg (National Square so-called Piazza), Prokurative (Republic Square) and the Riva (waterfront). If you like nature, do not miss a walk over Marjan hill. Where from Split? Answer on this question is really not difficult. Croatia is rich with cities and places that are certainly worth to visit. In this context, we'll mention the following destinations: Zagreb, Karlovac, Pula, Rijeka, Krk, Plitvice Lakes, Makarska, and Dubrovnik. You should, definitely, visit Zagreb and its Upper town (Gornji grad). Pula in the segment of historical sites has a lot to offer, as an example, we can mention the amphitheater in Pula from the 1st century. Rijeka the largest port and the third largest city in Croatia offers a lot of attractions and events that are just waiting to be discovered. If you go back from Split to Zadar we suggest you visit the Pag Island if you miss visiting before. If you decide to step outside of Croatia visit one of these destinations: Ljubljana, Sarajevo, Mostar, Belgrade, Podgorica, Budapest, Vienna, and Prague.